Ok, I’m Ready! It’s What I Ate Wednesday again! That’s where the fun food bloggers gather to share what they’ve eaten all week long or on a particular day. I never remember to photograph my food for an entire day. Maybe I should try that for next week. Besides, I sometimes can’t remember if I’ve used a photo already. Regardless, it’s hostessed by Jenn over at Peas and Crayons. Check out what everyone else is sharing when you finish here. I don’t have a lot to share, but I do have a few tasty treats. Last Thursday was a birthday celebration for one of Ralph’s sisters, Kathy. We went to the usual restaurant and I get a little bored with their choices but I do have one favorite that I seem to get regularly. But first I thought I’d shake it up with my salad choice. 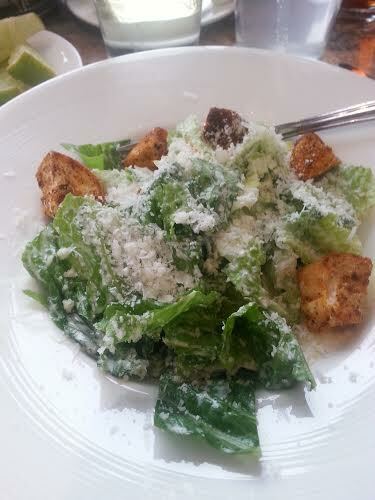 I chose the Caesar salad this time and I was very pleased. The dressing was tasty and they added lots of fresh grated Parmesan cheese. It was delicious! My entrée was one that I’ve gotten several times before, but I like it. It’s called Penne Mediterranean. 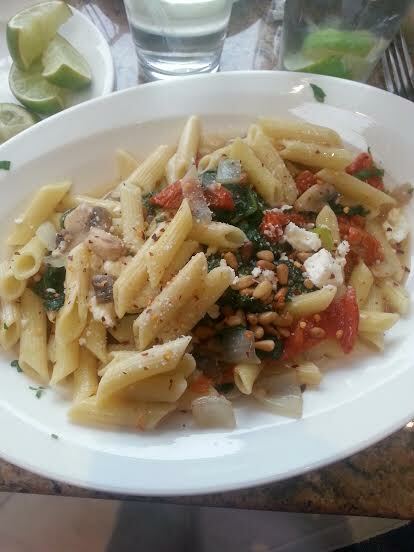 It has spinach, onions, tomatoes, feta cheese and pine nuts in a light garlic sauce. It is very good and it seems to be my go-t0 choice at this restaurant since we’re there so often. At least I’ve found something I like! Last but not least is another salad. There’s a pizzeria/restaurant that we’ve been going to a lot lately. They have an excellent Greek Salad. 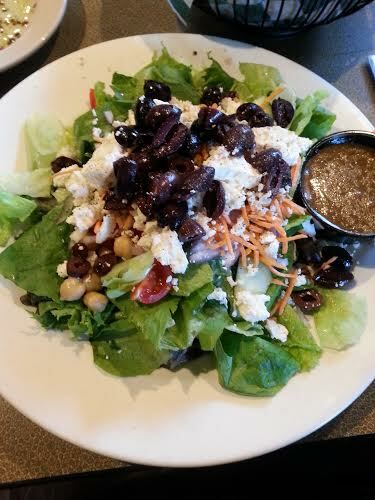 This is one of the best Greek Salads I’ve found in our area. Lots of olives and feta with garbanzo beans added in. They don’t mind that I ask for the dressing on the side and it’s a nice light balsamic vinaigrette. I just love it. I did have some of their wonderful bread which I showed last week. That always gets me! That’s What I Ate Wednesday for me this week. Be sure to check out what’s going on at Peas and Crayons. You’ll be glad that you did! This entry was posted in Uncategorized and tagged pasta, salad, WIAW. Bookmark the permalink. That caesar looks amazing!! All of that cheese, OMG!! Andrea, it was So good! Thanks for visiting! It was just delicious! It’s my go to choice at this restaurant. Thanks for visiting!